Better Minds Group offer brain training to improve attention (ADHD), self-awareness, social stress, sensitivity to context, emotional regulation, and resilience. We offer proven methods to improve the critical qualities of: attention (ADHD), self-awareness, social intuition, sensitivity to context, emotional regulation, and resilience. We are in a new world. The internet is speeding life beyond our understanding and control. Children have multiple sources of information, many beyond your understanding and control. Cognitive work has largely replaced physical work. Leading by fear degrades cognitive performance. Autonomy, Mastery and Purpose are the incentives that inspire. We help you understand this new world, your place in it, and give you, and those you care about, the flexible and adaptive minds to live, love, and work well- the wellspring of creativity. Behavior without context is meaningless. We blame ourselves too easily for things that go wrong whether they are within our control or beyond our control. We are literally in a state of hypnosis the first seven years of our life, unconsciously learning the good, bad, and ugly of how we fit into our surroundings. Our natural guiding intuitions are overridden by years of social conditioning. In stressful situations, primitive impulses can trigger and hijack our ability to make calm decisions. You get stuck. We help you understand how behavior can go wrong. We then help you stimulate healthy growth from the inside out. "I came to Dr. Barkett less than a year ago after years of cognitive behavioral therapy with various therapists to deal with depression. I was frustrated and not getting better. In less than a year, Dr. Barkett has guided me to understand and resolve the depression, uncover the cause of the depression which had been repressed all my life, and now deal with the issue so that I can begin to find happiness and contentment in my life. I’m a work in progress but with the incredible skills and compassion of Dr. Barkett, I now have goals and a plan for my future. I have been consistently able to see improvement in my brain’s ability to slow down the out of control thoughts, focus better on the work that needs done, and transition to positive thoughts. Each session has been an opportunity for growth and discovery." -D.
Assessments help determine our best course of action. To fine tune your goals, we use a set of evaluations that uncover your unique gifts and needs. We help you understand your personality style, your emotional style, and your cognitive style. Our sophisticated brain-trainer.com 20 site eeg (electroencephalogram) assessment reveals how effectively your brain is carrying out its duties. We generate a“what you do best” detailed report and training plan- our Blueprint for a Better Mind™. The Blueprint is especially helpful in identifying a career path that suits the life you desire. With the Blueprint in hand, we begin training your Better Mind. Clean out the trauma that keeps you from reaching your potential. Eye Movement Desensitization and Reprocessing, or EMDR, activates your brain’s hidden, natural capacity to heal old (often unconscious) traumatic memories, which trigger overreactions. EMDR also promotes creative problem solving and working through mental blocks by allowing you to think through the strong emotional reactions that have you stuck. "As someone who has sought counseling every few years about my weight problem, resulting in less-than-impressive results, I was initially skeptical when my wellness coach at the ultimateU recommended that I try EMDR work with Dr. Brian Barkett. Through my sessions I am now able to acknowledge the many long-ignored issues and feelings in my life that I have kept suppressed with food as my numbing agent of choice. I have never truly tapped into the reasons before, but Dr. Brian, using EMDR, has encouraged me to talk about these strong emotions that surface when I overeat, and then he discusses with me the events/feelings responsible for them. I grew up in a family that never encouraged me to go beyond the safe constraints of my place in the social hierarchy. So when I began to realize that my potential was so much greater, I climbed the ladder of success, but always felt guilty about doing so. I never felt that my family/friends/colleagues approved of my ambition and success, so I would eventually sabotage my success, resulting in feelings of failure that I would numb with food. The best part has been that Dr. Brian has helped me to see that I have the power to change how I interpret these feelings in the future so that I accept my potential, without feeling guilty and needing to turn to food. I am experiencing a freedom in my life that I have never had before. I highly recommend Dr. Brian and the EMDR technique because, together, they have helped me to free myself from the past so that I can enjoy living in the now." -G.
NeurOptimal® eeg biofeedback reads the electrical activity generated by your brain’s cortex to identify disruptive firing patterns. Then it gives your brain real-time feedback that allows it to self-correct for better function, more resiliency, and sense of calm. All while you relax for 33 pleasant minutes of napping, listening to music, or watching a movie. "Thanks to NeurOptimal® I've been able to end my dependance on anti-anxiety medication and live a more relaxed fulfilling life." -M.
"I am a firm believer in NeurOptimal® sessions. I have found myself able to remain calm in the face of most situations that would have elicited a reaction. My thinking is clearer and it feels like I am making better decisions. I would recommend it to anyone." 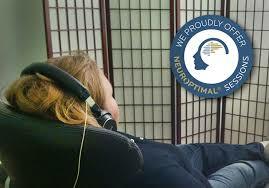 -E.
*Better Minds Group has no official relationship with Neuroscape. We just love the work they are doing combining eeg-biofeedback with video games.